Egyptologists lead expeditions to Memphis, Sakkara, Dahshur, the Pyramids of Giza, the Sphinx and the Solar Boat Museum. Venture to the Valley of Kings, King Tut's tomb and the famed Colossi of Memnon. 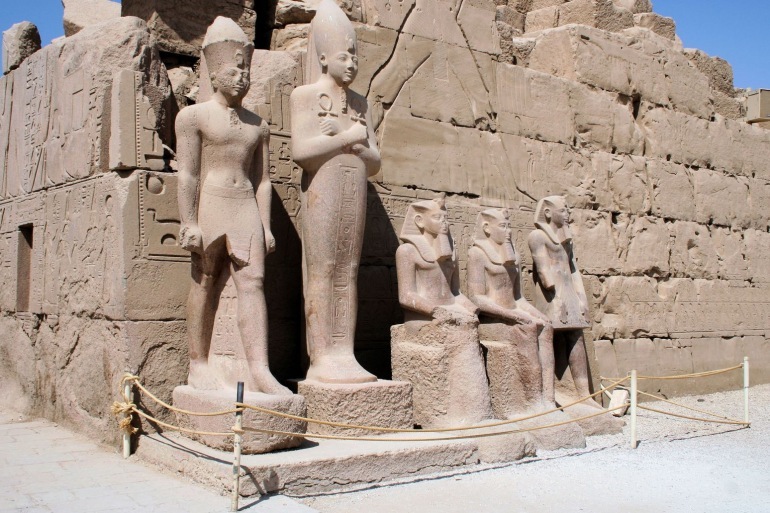 Delve deeper into Ancient Egypt during a four-night study cruise on the Nile. How were the pyramids built? What happened to Queen Nefertiti? And why does Tut Ankh Amon, the “boy king,” still capture the public imagination? Journeying overland and on the Nile, Egyptologists reveal the mystery behind Egypt’s storied history and the country’s place in the modern world. Evening: Depart on international flights to Cairo, Egypt. Afternoon: Arrival to Cairo International Airport and transfer to the hotel. We will gather in our private meeting room where the Group Leader will greet you with a warm welcome and introduce everyone. We will review the up-to-date daily schedule and any changes, discuss responsibilities, safety guidelines, emergency procedures, and answer any questions you may have. Please be aware that program activities and scheduled times could change due to local circumstances. In the event of changes, we will alert you as quickly as possible. Thank you for your understanding. Dinner: Enjoy meeting and socializing with your fellow participants at the welcome dinner at the hotel. Activity note: Today's activities include travel by coach and walking around historic sites such as the Pyramids, the Solar Boat Museum, and the Sphinx. The terrain is uneven and rough and it could take up to 30 minutes standing at each site in hot conditions and under the sun with no shade. There will also be a short walk to the lunch restaurant. The total amount of walking today could be up to one mile round trip from the bus car park. At the Solar Boat Museum there are between 80 and 100 steps. Morning: Led by your Egyptologist, explore the most renowned sites of Egypt: the Great Pyramids of Giza, the Solar Boat Museum, and the Spinx, with a great opportunity to see the sites up from a great panoramic view point and experience a unique short camel ride. The pyramids of Giza are perhaps the only true rival to the Great Sphinx when one thinks of ancient Egypt and its architecture. The Valley of Giza-- with its wonderful monuments-- is truly a marvel of architectural prowess. The three largest pyramids located in the valley consist of the Great Pyramid of Khufu, the Pyramid of Kafhre, and the Pyramid of Menkaura. Each Pyramid is a tomb dedicated to a different king of Egypt. Afterward, we will drive to the Solar Boat Museum. The significance of the buried boat is still debated. The Pyramid Texts clearly state that at the end of the pharaoh's life on Earth, his soul ascends to the heavens in the solar barque to join his father. The arguments focus on whether this boat was purely symbolic, part of the burial goods, or whether it was actually used in the funeral procession to transport the body of the king by river to his pyramid complex. While some scholars claim that there is evidence that the boat has been in water, Zahi Hawass, the head of the Supreme Council of Antiquities, points out that shavings of cedar and acacia found in the pit during excavation, indicate that it was probably built close to where it was buried. While the boat is of the right dimensions to be suitable as a river craft, no mast was found with the components. We will then continue on to the Sphinx of the Giza Plateau, which is the most famous and well known Sphinx in the world. It has been guarding the Necropolis for centuries. Following the Sphinx visit, we will return to the hotel by coach. Afternoon: Enjoy some free time to relax before a lecture about Egypt and the Nile. Activity note: Today's activities include travel by coach as well as walking and standing at Dahshur, at the Imhotep museum, and at the Pyramids of Zoser and Teti. The terrain is uneven and rough and it could take up to 30 minutes standing at each site. The total amount of walking could be up to one mile round trip from the bus car park. Morning: We will depart by coach to explore Dahshur, a necropolis of the Old Kingdom, housing some of the oldest pyramids built by and for the 4th dynasty pharaoh, Sneferu, around 2600 BC. This site best demonstrates how a strong willed king was able to build the first true pyramid, changing its design from the "step" pyramid. Afternoon: We will then explore the Step Pyramid complex of King Djoser (Zoser), which is considered the oldest stone structure on Earth, built more than 4700 years ago. It was built for the burial of Pharaoh Djoser by his vizier Imhotep. Next, we will visit the Pyramid of Teti, which is also located in the Necropolis of Saqqara. Its original height was about 172 feet. Inside it are some pyramid texts inscribed all around the walls of the burial chamber and the inner corridors. Afterward, we will explore a mastaba tomb, which is a great source of information concerning the daily life of the ancient Egyptians. A mastaba is a superstructure of a tomb that was built in the form of a huge bench above ground to house the funeral belongings of the deceased. Afterward, led by your Egyptologist, we will visit the Imhotep nuseum. The museum was opened in 2006, and displays finds from the site, in commemoration of the ancient Egyptian architect Imhotep. Dr. Zahi Hawass said, "I felt that we should call it the Imhotep Museum in tribute to the first architect to use stone rather than perishable materials for construction on a large scale. This man was second only to the King and in the late period was worshipped as a god." The museum also has a hall dedicated to a man, an important Egyptologist who excavated the Djoser complex all his life- the French Egyptologist Jean-Philippe Lauer. The museum has five large halls in which one admires masterpieces from Saqqara such as a Greco-Roman mummy discovered by Zahi Hawass during his excavations at Teti's pyramid complex. We will then return to the hotel where you can enjoy some leisure time before attending a presentation explaining Islam led by a scholar. Activity note: Today's activities include travel by coach. The drive from Cairo to Alexandria will take at least five hours by air conditioned motor coach. There are basic toilet facilities en route. This day does not involve much walking, but there are steps and you will be asked to take your shoes off to visit the church in the monastery. Morning: We will check out of the hotel and depart by coach for Alexandria. Enjoy an en-route presentation led by your Egyptian leader focusing on life in Egypt today to give you better insight into your host country. Led by your Egyptologist, explore the important sites of Anba Bishoi located in Wadi El-Natron and 62 miles northwest of Cairo. It is a natural depression in the desert consisting of salt lakes and salt flats laying in the desert. This place was important to the ancient Egyptians since it was from here that they extracted the Natrun salt. It later became more important during the early era of Christianity in Egypt as can be seen by the legacy of monasteries. It is presently the centre of many monasteries groups dating back to the fourth century AD. One of the most important monasteries today in Wadi El-Natroun is Dier Anba Bishoi and was named after the patron St. Bishoi who immigrated to the site and lived in solitude. The monastery was restored several times after it had been destroyed at the hands of the barbers. It has five churches; the main one is the St. Bishoi church which dates back to as early as the 9 century AD. This church today is only used during the summertime. To the east of this church lies another one known as the church of Al-Adra (the virgin), and it is only used during the winter months. Your local guide will explain the reason behind this. The monastery contains the remains of St. Bishoi, and Ephraim the Assyrian, and Paul of Tomah. Lunch: At a local restaurant in Alexandria. Afternoon: Enjoy a brief panoramic discovery of the ancient city of Alexandria. The Eastern Harbor of Alexandria has been a crossroads of culture and continents for 2,300 years. This is where the Pharos lighthouse, one of the seven wonders of the ancient world, guided people from all nations safely into port; where Queen Cleopatra first laid eyes on Julius Caesar. Afterward, we will visit the Library of Alexandria; In 2002, Alexandria recaptured the spirit of its richest legacy—the Great Library of Alexandria—by opening the new Bibliotheca Alexandrina. The new library shares the same universal goals as the ancient one built by Alexander the Great. It is a focal point for research, the advancement of knowledge and the open exchange of ideas. Later on, we will transfer by coach to the hotel where you will have time to relax before dinner. Activity note: The drive around Alexandria will take at least three hours by air conditioned motor coach. Today's activities will involve walking and climbing steps around historic sites such as the Roman Amphitheatre, the Catacombs, and the National Museum. At each site, there is standing of up to one hour. The total amount of walking today could be up to one mile round trip from the bus car park. Morning: Led by your Egyptologist, continue discovering the great historic sites of Alexandria. We will begin with the catacombs and then explore the Roman Theatre and the National Museum. The catacombs of Kom es-Shouqafa were tunneled into the bedrock in the age of the Antonine emperors (2nd century A.D.) for a single wealthy family still practicing the ancient religion. As a privately financed project, it is an engineering feat of some magnitude. These tombs represent the last existing major construction for the sake of the old Egyptian religion. Though the funerary motifs are pure ancient Egyptian, the architects and artists were schooled in the Greco-Roman style. Applied to the themes of Ancient Egyptian religion, it has resulted in an amazing integrated art, quite unlike anything else in the world. Afterward, we will explore the well-preserved Roman theatre with galleries, sections of mosaic-flooring, and marble seats for up to 800 spectators. Our next visit is the Alexandria National Museum where the Egyptologist will give an overview before you explore on your own. The museum has grown in importance these days, and is now considered one of Egypt's finest museums. It was inaugurated by President Hosni Mubarak on December 31st, 2003, and is one more addition to the reasons one should visit this grand old city. The national museum is located in a restored palace and contains about 1,800 artifacts that narrate the history of Alexandria throughout the ages, including the Pharaonic, Roman, Coptic, and Islamic eras. There are even some more modern pieces, including 19th century glassware, silverware, chinaware and precious jewels, which provide a sense of the richness of the court of Mohammed Ali and his descendants. Mummies are shown in a special underground chamber (basement). In addition, some of the items found during the archaeological underwater excavations in Alexandria are now on the same floor as the Greco-Roman artifacts. Afternoon: We will visit the Citadel of Qaitbay before returning to the hotel by coach where we will have a presentation led by a leading professor/lecturer on the archeological work being done to re-discover the destroyed lighthouse. Activity note: The drive from Alexandria to Cairo will take at least five hours by air conditioned motor coach. There are basic toilet facilities en route. This day involves walking around the museum of approximately 2-3 hours and climbing steps to the first floor. The total amount of walking today could be up to half a mile round trip from the bus car park. Breakfast: Boxed breakfast from the hotel. Morning: We will return to Cairo by coach. Enjoy the sites of Egypt while you relax. Lunch: At a local restaurant in Cairo. Afternoon: Explore the Egyptian Museum including the mummy room after an introduction by an Egyptologist. The museum houses thousands of artefacts from jewelry and statuettes to reliefs. There are even entire monuments that were brought from their ancient contexts and are on display. We will then travel by coach to the hotel where we will check in upon arrival and enjoy a lecture titled, "Egyptian Social Life" led by a lecturer from Cairo. Activity note: The drive from the hotel will be through traffic and could take at least a few hours by air conditioned motor coach. This day will involve walking and climbing steps around historic sites and standing for up to one hour at each site. The total amount of walking today could be up to one and a half miles round trip from the bus car park. Morning: We will depart by coach to dscover historic Cairo. Led by your Egyptologist, explore Ibn Toulum Mosque, El-Moez Street, and Khan el-Khalili Bazaar. A great example of 9th century mosques, with its unique minaret, is Ibn Toulum Mosque. Covering an area of about six acres and located in the heart of Islamic Cairo District, El-Moez street is one of the richest streets with Islamic architecture still existing. Khan el-Khalili Bazaar is the most famous tourist market in Cairo. You will have time to walk around on your own and interact with the locals. Afternoon: Discover the Hanging Church, St. Sergius Church, and Ben Ezra Synagogue. These all illustrate the intricate relation between religions. Enjoy the rest of the afternoon at leisure. Dinner: On your own to explore local cuisine. Activity note: This day includes a flight and a very early start. The drive from the hotel to the airport will take at least one hour by air conditioned motor coach through traffic in Cairo. In Luxor, there is less traffic and a shorter distance to drive. Today's activities will involve walking around historic sites and climbing steps. The terrain is uneven and rough and it could take up to 50 minutes standing at each site in hot conditions and under the sun with no shade. Morning: Early transfer by coach to the Cairo Airport for flight to Luxor. Upon arrival in Luxor, we will travel by coach to board the ship for lunch and check in. Afternoon: We will depart by coach to explore the Karnak and Luxor Temples led by your Egyptologist. The Karnak Temple Complex was the center of the ancient Egyptian civilization for centuries. The Luxor Temple is an ancient Egyptian temple dedicated to the god Amun-Ra and contains Christian, Roman, Greek, and Muslim influences. Afterward, we will return to the ship. Activity note: The drive from the East to the West Bank of the River Nile will take at least 30 minutes by air conditioned motor coach. This day involves walking two miles around historic sites such as the Valley of the Kings and the various tombs including Tut Ankh Amun Tomb. The terrain is hilly and there are up to 25 steps at the tombs to take in one direction and back, and it could take up to 30 minutes standing at each site in hot conditions and under the sun with no shade. Morning: We will depart by coach for our explorations. We will begin at Habu Temple where there will be a presentation on the ongoing new discoveries and digs in Egypt led by a university professor. Afterward, led by your Egyptologist, discover the West Bank Valley of the Kings, King Tut Tomb, Hatshepsut, and Memnon. The West Bank Valley of the Kings was used as the royal burial place for about 400 years. Enjoy the tombs of the famous kings of ancient Egypt with their great carvings and magnificent colors. The Hatshepsut Temple was one of the very few temples of Egypt to be dedicated and built by a woman. It has a unique modern architecture that made it difficult to believe its age. The Colossi of Memnon are two giant statues standing at the edge of the desert separating the old from the new. Afterward, we will return to the barge by coach. Afternoon: We will depart for Luxor Library where a professor will lead a presentation discussing the Opet Festival and the ongoing restoration work of Luxor. We will then return to the ship where you will have time to relax before dinner. Activity note: Today's activities include walking around historic sites and a ride on horse drawn carriages (this could be substituted by bus ride). The terrain is uneven and there are up to 25 steps to climb at the entrance and ten at the exit. It could take up to two hours standing at each site in hot conditions and under the sun with no shade. The total amount of walking today would be up to one and a half miles round trip from the car park. Morning: Led by your Egyptologist, explore Edfu Temple. The Horus Temple at Edfu, dedicated to the Falcon God Horus, is one of the largest in Egypt. Afternoon: We will continue or exploration with a visit to Kom Ombo. Dedicated to the Gods Sobek and Haeroris, Kom Ombo was built during the Ptolemaic Dynasty in the second century BCE. Several hundred crocodile mummies were uncovered during initial excavations. Activity note: Today's activities include climbing approximately 40 steps and the terrain is uneven and hilly. It could take up to one hour standing at each site in hot conditions and under the sun with no shade. The total amount of walking today could be up to half a mile round trip from the bus car park. There are up to 20 steps at the dock and on the Felucca ride. Morning: Led by your Egyptologist, explore the sites of Aswan; visit Philae, High Dam and the unfinished Obelisk. Philae is known as the temple of romance and was dedicated to the great goddess Isis. It is also located on an island in the middle of a man-made lake. Completed in 1970, the dam has proved both beneficial and detrimental to Egypt. While the dam’s construction has been integral in generating electricity, erosion, poor silt deposition, and a slew of other environmental problems have developed. Afternoon: Enjoy the uniquely Egyptian sailing experience on the Nile on a Felucca. Feluccas are sailboats that have been used on the Nile for decades and are made with a traditional design as well as with broad canvas sails. Essentially, the craft is reliant on wind-power with no motor, and are dependent upon the wind factor to propel forth. Afterwards, enjoy some time to relax before dinner. Activity note: Today's activities will involve some steps and the terrain is uneven and rough. It could take up to one and a half hours standing in hot conditions and under the sun with no shade. The total amount of walking today could be up to one and a half miles round trip from the bus car park. Morning: We will check out and disembark the ship for Aswan Airport for the flight to Abu Simbel. Led by your Egyptologist, spend the morning exploring the Abu Simbel Temple. Carved out of bedrock by King Ramses II, it is said that it should be the 8th wonder of the world. We will then return to the airport for the flight to Cairo. Lunch: A box lunch will be provided before the flight. Afternoon: We will depart by coach to the airport for the flight to Cairo via Aswan. Upon arrival, we will transfer to the hotel for check-in. Morning: Early morning transfer to the Cairo International Airport for flights home. If you are returning home, safe travels. If you are staying on independently, have a wonderful time. If you are transferring to another Road Scholar program, detailed instructions are included in your Information Packet for that program. We hope you enjoy Road Scholar learning adventures and look forward to having you on rewarding programs in the future. Cairo-Pyramids Hotel is located on the footsteps of the Pyramids of Giza. The Hilton Alexandria Corniche is located a short distance from popular Alexandria attractions, shopping, and dining options. It features a private beach, which can be reached via a complimentary shuttle service. Located in the heart of the city centre facing the River Nile the Semiramis InterContinental is close to the Egyptian Museum, the Cairo Opera House and the Cairo Tower. The Citadel, Old Cairo, downtown shops and the commercial centre are nearby. The Giza Pyramids and Cairo International Airport 25 km (16 miles) away are easily accessed.